Dr. Beach's translation makes Westerink's helpful volume on covenantal baptism widely available to the general reading public. 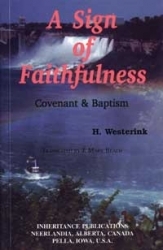 Westerink writes about the assurance our Lord offers us in our baptism, even if we were baptized as infants. Since many today oppose infant baptism, a correct understanding of baptism is essential for our comfort and the call to faith. Westerink patiently walks the reader through the Old Testament on matters pertaining to God's covenantal grace and the signs that accompany it. He then shows how these same promises apply to believers and their children in the New Testament. Thus readers of this small volume are shown the beautiful unity of the Lord's one covenant of grace throughout human history.